My friend L has once again came up with new findings. This time she outdid herself by going all over Malaysia (almost) in search of all types of chee cheong fun. I had talked about this particular special noodle before, and the one I showed was the fried style. 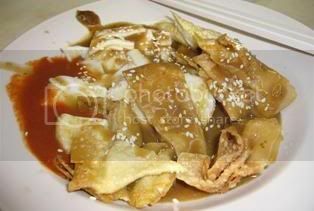 This one is the true way chee cheong fun is served, but of course in also its many varieties. Let’s see what L had come up with, after a series of searching, tasting, analyzing and documenting (now I sound like I studied too much). 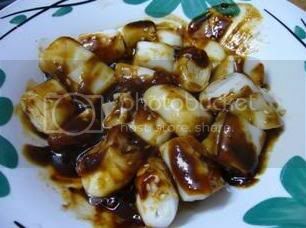 When I was growing up, ‘chee cheong fun’ was one of the foods I grew up eating. It is basically steamed flat rice noodles (about a finger’s diameter), cut up into little pieces and then served with a dash of sesame seed and sauce. 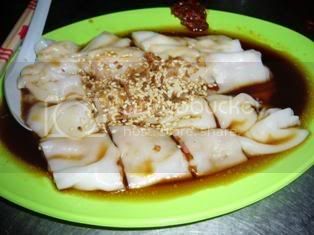 Now, I can’t tell you what kind of sauce in particular because as the years go by, and when I began to venture out of my humble old town, I realized to my delight, that ‘chee cheong fun’ comes in different variations in different regions. 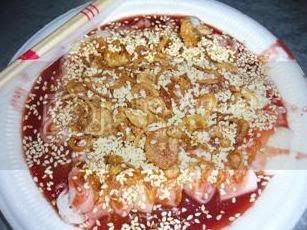 In my old town Taiping, ‘chee cheong fun’ comes with a rich dose of sesame and fried onions and a type of red sauce which is pretty sweet. The makers would usually add some chilli sauce alongside, to enrich its taste. Sweet is pretty blunt for a Chinese cuisine, you see. There’s another type of ‘chee cheong fun’ found here and pretty much everywhere else, called the Hong Kong ‘chee cheong fun’. Steam flour noodles, with shelled prawns and pork embedded in between. It usually comes with soy sauce as its gravy, topped with fried onions and again, sesame seed. Then, found in central Malaysia, Kuala Lumpur’s ‘chee cheong fun’ is actually my favorite among all. Again, the signature steam flour noodles and sesame seed, the version here allows you to choose from a choice or steam or fried ‘yong tau fu’ to accompany your noodles. Garnished with fried onions as well, it is a great alternative to rice. Way up north in the gourmet island of Penang, the ‘chee cheong fun’ here, is of sweet taste. Thanks to its sauce which is made up of chilli, rojak paste and peanut paste. Again, it comes served with sesame seed. I hope you enjoy my ‘chee cheong fun’ review found here in Malaysia. If I missed out any version, please drop your comments and till then, happy eating!